Licensed by Creative Commons One way to repay students loans is using an automatic payment plan. Student loans are what nightmares are made of for many graduating college students. The automatic six-month deferment feels like nothing when worrying how to repay the copious amounts of money owed. 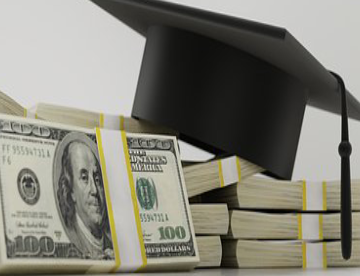 There are some tips and tricks to learning how to best deal with student loan repayment. “I would ideally like to pay it off fast, but it all depends on the job I get and how much I can afford,” said Reyanna Keglovitz, a junior at ESU. Making more than the required minimum payment can be effective in getting the principle of the loan down at a quicker pace. A tip to keeping to this is to set up automatic payments with the extra money added in. This makes it harder to change and easier to stick to. “I plan on looking at all the different payment plans with the different interest rates to find the on that suits me best,” Keglovitz said. Another way that can be quite effective is to use some extra money and make a large payment. This can come from a tax refund and although it might not sound like the best thing to do with the money, it will pay off in the long run. There are also federal student loan forgiveness programs for certain degrees. For example, teacher student loan forgiveness is only offered to teachers. Many of these forgiveness programs have a certain criterion that must be met. Most jobs consider giving their workers raises every year. When this occurs any part of the raise can be put towards the loan repayment. This is a nice option because it is money that wasn’t there before, so it does not feel like a payment is being made. One of the better ways to handle student loan debt is to try and find an income-based repayment plan. This is largely helpful because it takes into consideration how much one can handle based on their monthly income. The best way to keep yourself on track with the repayments is to refinance and consolidate. Overall, this is one of the most effective options for many graduated college students. Consolidating your loans makes managing them much easier. It allows for more than one loan to be merged into one for an easy monthly payment. The goal of refinancing is to decrease interest rates. This makes the monthly payment decrease and allows for easier repayment. The best advice is to start making payments before the student loan comes due. This will allow your principle loan to decrease and which also decreases the amount of interest that accrues. Student loans can be a scary thing but knowing all your options and making informed decisions can help keep you ahead of student loan debt.